When you need to let someone in from your driveway gate and into your residence, it is often hard to know what the person wants from you. If you have an Intercom System, the process becomes much easier and you can decide if they need to come into your home. Intercom systems vary because there are many different types to cover the needs of various properties and they have pros and cons of their own. Choosing which gate intercom system is the best one for you will make a big difference in your experience with your automatic gate. Some of the brands that you should consider before making your final choice are Doorking, Linear, and Aiphone. Each of these systems run a little differently and it's better to choose based on your own needs. To fully understand the different options and what they mean for you, you should consider calling “Gate Repair Valencia”. We can give you all the details and tips you need to decide which kind of intercom will fit you the best. 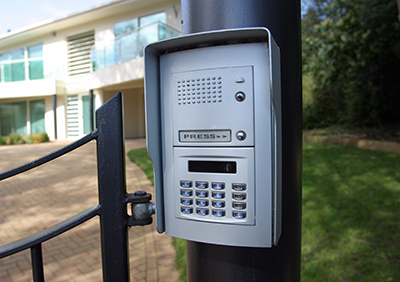 Our professionals are trained and have expertise in intercom installation and programming. Installation should also only be done by a trained professional that knows what he is doing. Our gate repair contractors are experts in these systems and have the capacity to install them correctly and quickly. After the installation has been completed we will program the Doorking intercom or any other brand system at once. We will also help you understand how it works. Learning how to talk and respond from your home are both important so that you can refute or grant access to your visitors. Once your phone enter system is up and running you can use it and relax. Relax and enjoy your Intercom System until something goes wrong, then be sure to have one of the intercom repair technicians of Gate Repair Valencia over to help you get it back to its best working order. Your intercom will save you time and effort and is worth investing in it. Get in touch with us for immediate services!